As I was putting away Ella's clothes this morning, she would pick something out and then bring it to me to put on her. She started with a pocket-t gray long sleeve, then added a very cute bubble skirt, layered it with a summer dress, and topped it off with a pj shirt. Then to accessorize she added some purple polka dot leg warmers on her arms, a pink crochet hat and two different sandals. When her outfit was complete she spun in circles saying "oooh and aah." She knew she looked good! haha, I love this!! 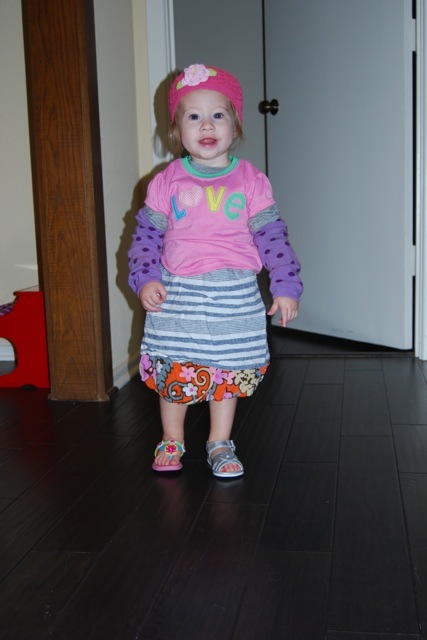 Sometimes I do the same thing...there's something to be said about wearing all your favorite things at once...GO Ella!!! I love, love, love this!!! I want Ella to pick out my outfits! Maybe she could make me a good Halloween costume! oh my goodness!! i laughed so hard at this one! that ella... will she be ON broadway, or be the one making the costumes behind the scenes? ?